HUNTINGTON, W. Va. —This one was all about gaining experience on an immaculate course. 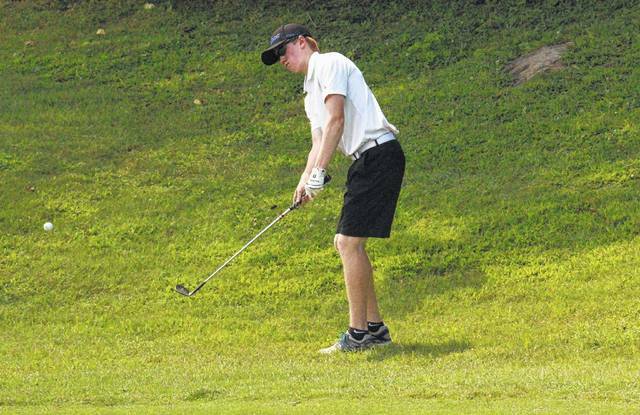 That’s because the young Gallia Academy High School boys golf team competed at the annual Duke Ridgely Invitational on Friday — and placed eighth out of 11 teams that posted team scores at the pristine Guyan Golf and Country Club near Huntington. The Blue Devils fired a team total of 261 — operating with West Virginia’s rule of playing four scores but counting only three. This was the second season in which Gallia Academy was invited to play in this event, which is hosted by two-time defending West Virginia Class AAA state champion Cabell-Midland. Cabell-Midland actually fielded three teams, as Rock Hill and Ironton —members of the Ohio Valley Conference with Gallia Academy —only combined to sport three players. The Blue Devil trio of senior Kaden Thomas, freshman Cooper Davis and sophomore Reece Thomas tallied the team total of 261 — as Kaden Thomas shot an 81, Davis an 89 and Reece Thomas a 91. Wyatt Sipple shot a 124 for the club’s non-counting card. Parkersburg, paced by medalist Isaac Prine with a smooth four-under-par 67, captured the team title with a 224. The Big Reds’ win snapped a seven-year streak of victories by the host Knights, which were the runner-up with a 237. As part of Prine’s fine round, he made a hole-in-one on the par-3 155-yard 12th-hole with a 9-iron. In fact, Kaden Thomas —playing in the same foursome —bore witness to the ace, along with Josef Dransfeld of Cabell-Midland and Ty Queen of Wayne. The next six squads all finished within nine shots of one another —and included Huntington St. Joseph (252), Cabell-Midland B (256), Fairland (257), Huntington (260), Wayne (260) and Gallia Academy (261). Spring Valley was ninth with a 269, followed by OVC member Chesapeake at 290. Cabell-Midland C shot a 331, as Fairland is also a member of the OVC. Dransfeld was the medalist runner-up with a two-over-par 73, as Rock Hill’s only golfer —Logan Reed —placed third with a 75. Prine, Dransfeld and Reed were joined on the all-tournament team by Queen with a 77, Andy Michael of Cabell-Midland with a 77, and Garrett Ballway of Parkersburg with a 76. The Blue Devils return to action on Wednesday when they travel to face Fairland. Gallia Academy’s Kaden Thomas chips to the third hole during a recent Blue Devil golf match at Cliffside Golf Club in Gallipolis.